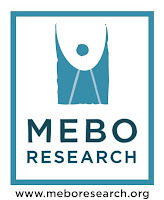 at 12:00 noon; 8:00 p.m.
Our very own private terrace at the roof of the Penguin Hotel has been reserved for the MEBO South Beach Meetup/Conference 2017. 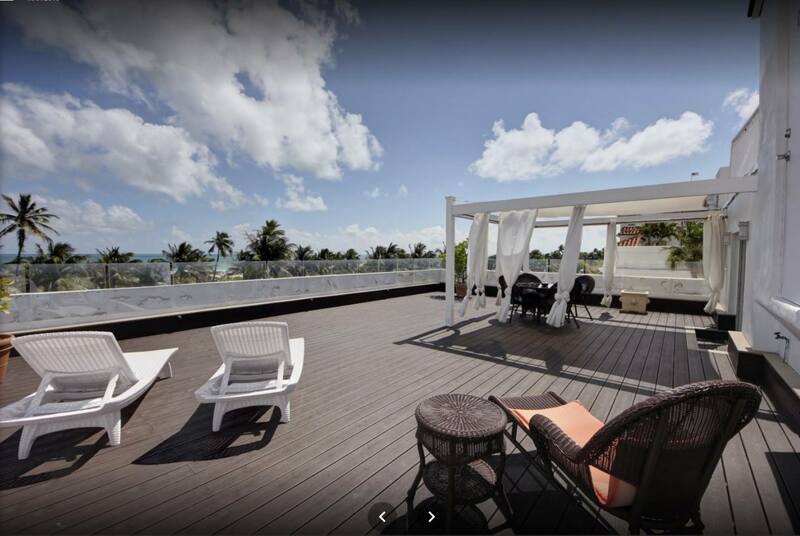 It is a beautiful space with a spectacular view of South Beach, Lummus Park, and the ocean. 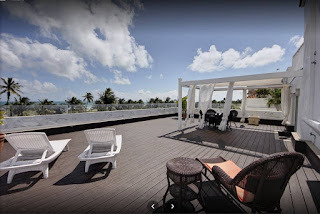 The roof terrace is ours to use privately for MEBO throughout the day for the meetup/conference and later in the evening to enjoy the view and ocean breeze. It has a cover for shade and now has new furniture. We can get more chairs to accommodate everyone. As you can see, it is a large space surrounded by palm trees and a nice ocean breeze in the Spring. The terrace is very private because no one can see us from the ground, but we can see them. 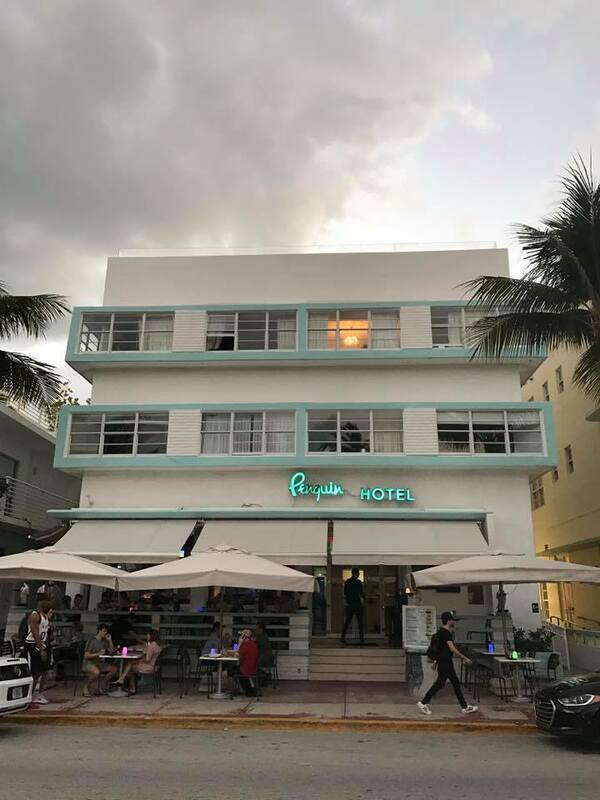 With an ideal oceanfront location in South Beach’s Art Deco District, the Penguin Hotel is a cozy and charming accommodation choice that contains an on-site restaurant and bar. Positioned on Ocean Drive, the hotel is just 15 minutes away from Lincoln Road Mall on foot, but it's easier to hire Uber (very inexpensive for such a short distance). It features free Wi-Fi in room and lobby, Restaurant, Bar (Only Valet parking for $), Washing machine, room safe, clean beach towels found at the lobby. NOTE: Hotel deals sell out VERY QUICKLY for the Spring. 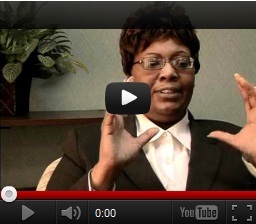 Please reserve your hotel sooner than later, or it can get very expensive very quickly. Some payment plans may include daily breakfast; double check whether your booking plan includes it. Parking is always an expense at Miami Beach. Best way to get around is on foot or Uber. You can book your reservation for this meetup directly with the Penguin Hotel, if you want to stay there, or other recommended hotels nearby could be anywhere on Ocean Drive or Collins Avenue (5th Street to 17Street). It's best to see the reviews of the hotels, and to check whether they have elevators or not, especially in the Art Deco District. Good sites to look for good hotel early advance booking deals are Trivago.com (check by ratings and cost), Kayak.com, Booking.com, and others. For deeply discounted rates, I recommend Rock Hostel, which is selling out very, very quickly. It's only a couple of blocks for the meetup. In addition to being a special event in which sufferers meet each other and offer each other friendship and support, this meetup intends to provide sufferers with information on current and past research projects, to share odor management protocols for the various odor conditions. It is a great opportunity to share the beauty that surrounds us with South Beach literally across the street! Spouses, partners, family members are welcome to socialize with us at the beach and to eat with us. Any of them who want to learn about odor management conditions can join the discussion, which will start at 12:00 noon on Friday. Some of us leave on the Jamaican/Grand Cayman cruise on Saturday, organized by Abbey Mcphaul Merriweather, but those who are not going on the cruise can make it a longer week vacation at South Beach! More updates about the material to be discussed during the conference part of the meetup will be forthcoming in future posts in this blog.